When you think of the color yellow, you probably think of cheerfulness, peppiness and optimism. Scientists say the color represents intelligence. Or, if you’re like me, the color yellow represents my awesome highlighter – either way, yellow is very noticeable. So don’t be scared to pair it with attention-grabbing chic accents, like this necklace from Francesca’s Collection or shoes from Just Fab. Wearing the right color can bring out your skin tone and brighten it up. If you’re a brunette, bright yellow is a great color and if you’re a blonde, I suggest sticking to a lighter tone. When wearing such a bright color, be sure to choose a piece that flows and accents your curves instead of highlighting the bad parts. So hopefully the next time you’re shopping, you consider sprucing up your wardrobe with this fun, bright shade. 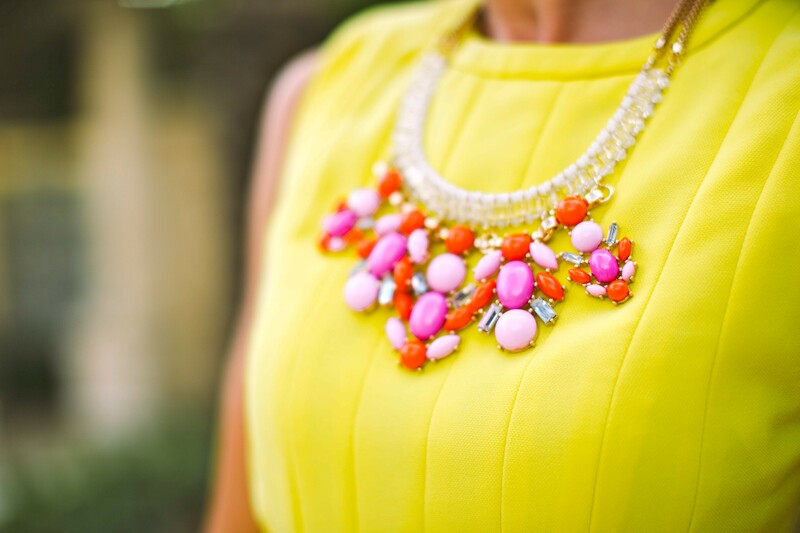 Love the dress and combination of colors for the accessories. Very Easter like!